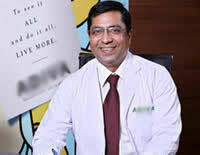 Dr. Singh is the Senior Consultant Cardiologist at our center. Qualified MBBS, MD and DM ( Cardiology ), Dr. Singh has been serving community for 23 years in the field of medical diagnosis and medicine. His expertise lies in coping with medical issues related to diagnosis and treatment of congenital heart defects, coronary artery diseases, heart failures, valvular heart diseases and electrophysiology.